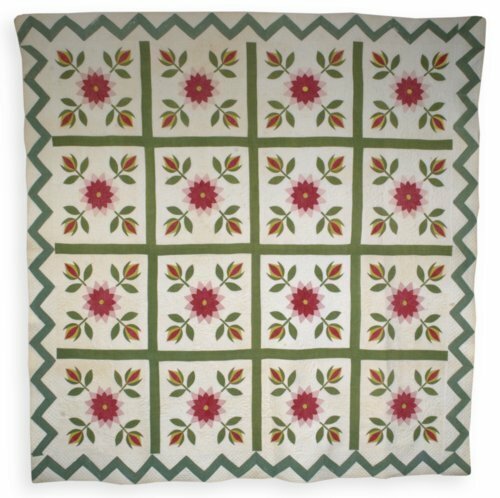 Red and green cotton appliqué quilt made in a variation of the Rose and Tulip pattern. This quilt is atypical because its pattern typically is appliquéd rather than pieced. The likely maker, Rachel Yarnell Parks, was born in 1812 in Knox County, Tennessee, and died in 1890 in Moniteau County, Missouri. Piecing an appliqué quilt design is a Tennessee tradition. The floral designs are on pieced circles inset into the blocks. White cotton binding, backing, and probably batting. Hand-quilted designs include diagonal lines, grids, and outline stitching, highlighted with foliate and floral designs.